Will my Jack Russell get along with a Maltese/Pomeranian/Celia mix? 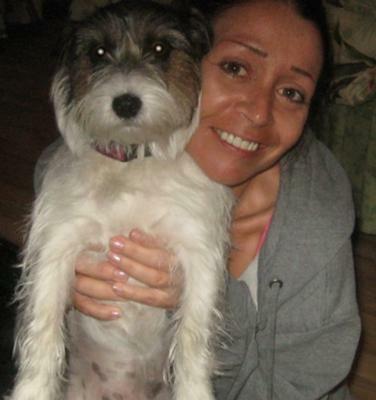 My husband and I are childless and own a 3 year old broken coat Jack Russell (female) along with two other dogs. One is a rescue dog... Part Rottweiler/German Shepherd (male)who is 6 years old. The other dog (female) is also a mix breed. A medium sized German Shepherd mix. We live on an 18 acre farm, and while the two larger dogs roam free, the JRT is more of an indoor dog. When she goes out, I keep an eye on her as there are all sorts of critters roaming around at any given time. All of our dogs get along very well - especially our JRT and Rottweiler. My question is this: A family member who's in university got a Maltese/Pomeranian/Celia mix (male) who's about 6 months old, and bit off more than she could chew - no pun intended! :-) She recently asked if we'd be willing to take her dog, as she's working for the summer and returning to school in the fall. Her parents are unable to keep the dog. I'm not very worried about our larger dogs, but I'm wondering if our JRT will get along with the new dog should we take him? She's basically my baby, so I'm worried that she may get jealous. Also, how big do you think this dog will be when he's full grown? Thanks in advance for any advice you may be able to offer! Comments for Will my Jack Russell get along with a Maltese/Pomeranian/Celia mix? Hi, well I know my jack russell is territorial, however, if your jack gets along with the other two dogs and they have all that land to run and play on, chances are, they will accept the new dog. It doesn't sound like the new dog will be too much larger than the jack russell, however, I am not sure. If your friend with the dog is willing (or able) to let you try it before truly accepting that responsibility, you should let them bring the dog over. Hope I've helped, but all jack russells are different and I cannot say if your would accept a new dog or not, but I'd be willing to say YES. It may take your jack awhile to warm up to a new baby, however, they may end up being very close!